The mountains and hills that surround the Truckee Meadows offer the perfect vantage point for some seriously beautiful Reno scenic overlooks. Whether you go north, south, west or east, you can find a peak to see a peek of Reno’s skyline. You can access some of these scenic overlooks with an easy drive, while others require a bit of a hike. No matter which you choose, you’re guaranteed a stunning view. 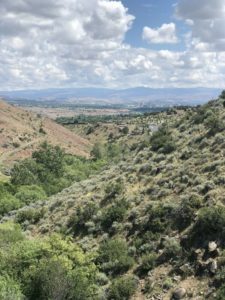 Ballardini Ranch Trail is a beautiful, 2.5-mile loop with great views of Reno and the valley floor. 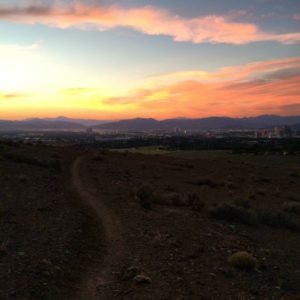 Located near Southwest Reno, this trail is open to hikers, bikers, and runners. Parts of the path are rocky and uneven, so it can be moderately challenging to traverse. Dogs can come too, as long as they are kept on a leash. To get the best views, start at the Ballardini Ranch Trailhead, which has a large parking lot, pit toilets, and a small picnic area. From here, head northwest out of the lot and up a short ridge. When you find the split in the trail, stay to the left. There is a short Lookout Loop at the top of the trail with excellent views. To get the best scenic view from Hidden Valley Regional Park, you’ll need to venture away from the gradually graded loop trails on the valley floor and head toward the Highland Trail. This 2.3-mile loop, located near Hidden Valley, climbs halfway up the hillside of the Virginia Range and offers stunning views of the Truckee Meadows and the Carson Range. Access this area via a gate at the mouth of the canyon, which is a short walk from the southeast corner of the horse arena. In Geiger Lookout Wayside Park, you can find near panoramic views of the valley floor. Located, located near the Virginia Highlands you can get to this scenic overlook by heading south on Alt Highway 395. To get to Geiger Lookout point, take Highway 341 toward Virginia City. The road snakes through spectacular mountain ranges and a rocky landscape. At the A 4.6-mile point, there’s a turnout where you can see stunning views of the Sierra and the Biggest Little City. 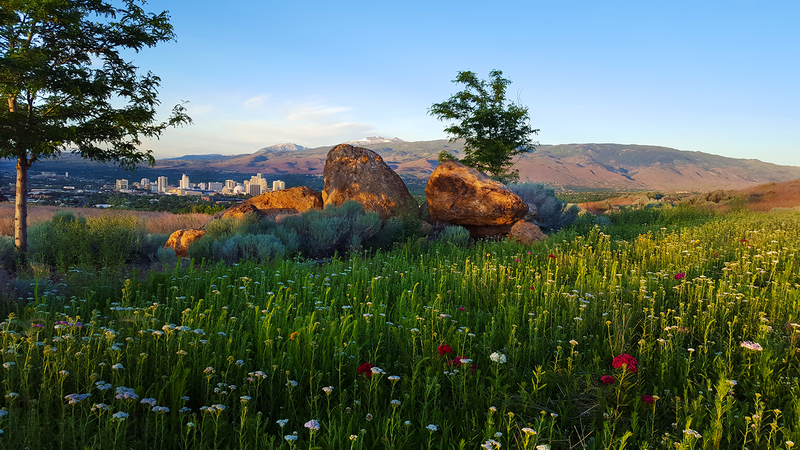 Located in Southeast Reno, the Huffaker Park Lookout Trail is a 1.7-mile, moderately inclined trail that offers a scenic overlook view of Reno. The park is easily accessible all year and native plants including sagebrush and rabbitbrush line the gravel trail. The summit of the trail offers 360-views of the city and the valley floor and a gazebo with benches by on the west side. During wildflower season, hikers, walkers, runners or mountain bikers can see pops of color all around. Located near Caughlin Ranch, Hunter Creek Trail offers scenic views of Reno and features a waterfall. The trail is about six miles round-trip with a total elevation gain of 1,428 feet. The trail starts at the Michael D. Thompson trailhead, which has a parking lot, drinking fountain and toilets. A significant part of the trail doesn’t have any shade. So, bring extra water, sunscreen, and a hat on sunny days. Dogs and horses are welcome to use this trail. 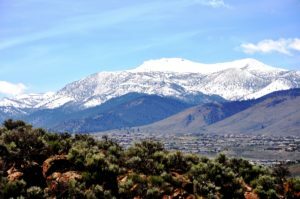 The view from Keystone Canyon Trail near Northwest Reno shows off Northern Nevada’s high desert scenery and wildlife. The trail is about 5 miles out and back, and of moderate difficulty. The main trail is wide with a gradual gradient. Dogs are welcome on the trail, as are mountain bikers. To get to the trailhead, look for the intersection of North McCarran Boulevard and Keystone Avenue. From there, take Leadership Parkway north and west. The trailhead will be on the north side of the road. 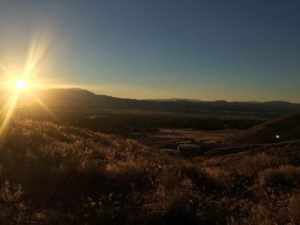 The short and steep climb up Rattlesnake Mountain, located in Southeast Reno, offers a prime location to see beautiful views of the valley floor and planes as they take off and land at the Reno-Tahoe International Airport. The round-trip hike is less than two miles and is accessible year-round to walkers, hikers, bird-watchers and dogs. 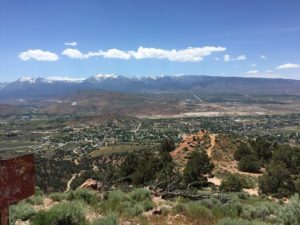 The trail becomes moderately steep over the 400-foot gain to panoramic views of the entire Reno metro area, stretching from downtown Reno to Mount Rose and the Carson Range. To get to the trail, park at Huffaker Hills Park and look for the Huffaker Hills Trailhead. 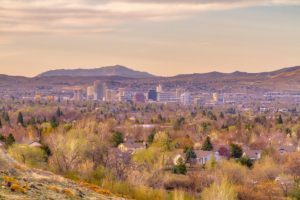 Close to Northwest Reno, University Ridge Park offers beautiful views of downtown Reno and Mount Rose without the hike. This City of Reno park offers barbecues, basketball and exercise courts, a picnic shelter, playground, restrooms and tables, and benches. There are also a few winding trails through small rock croppings. Check out this scenic Reno overlook for an easily accessible place to have a picnic or for a place to watch the sunset. 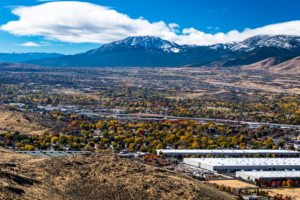 Arguably Reno’s favorite scenic overlook spot, Windy Hill offers spectacular views of downtown Reno and the surrounding valley. Access to Audrey Harris Park, where the scenic overlook is located, is easy. Simply drive south on Lakeside Drive past South McCarran Boulevard near Southwest Reno. At the turnout for Windy Hill, there are about 15 parking spaces and four semi-covered benches. There is also a 30-minute hike from the park to take down to Bartley Ranch Regional Park. At Dickson Realty, our team of local experts knows where to find the best Reno scenic overlooks and more. To learn more about how to enjoy the Reno/Sparks region, contact one of our Realtors today.